The last few weeks, our family was blessed with a relative who lived in the province. He was waiting for his papers back to Dubai and while he was waiting time in our house, he thought of doing a little gardening in our house. In fact, not just a little gardening but an entire vegetable garden plan. For the past few months my uncle has been plotting a vegetable garden plan for his own backyard. Now he has mustard greens and bokchoy beaming with life. In our home, our house has failed in maintaining decorative garden plants but we have had our luck in having chili (sili) shrubs and calamansi tree. These were random growths after randomly sprinkling seeds in our garden. We’ve also grown some ampalaya because of this method. My uncle has been advising us to push our vegetable luck by growing a garden. My cousin, having heard the idea decided to help us start our vegetable garden. He has now created patches for mustasa, pechay. 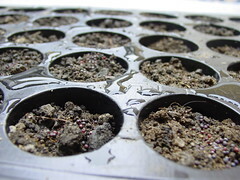 We’ve also started our seedlings for our pechay. We’re also plotting for eggplants, tomatoes, some basil, maybe rosemary, onions, tomatoes, and maybe even some coriander. It’s quite exciting really. I honestly don’t have a green thumb, but it’s a great idea. I’ve been playing this game called Harvest Moon wherein you can get a shot at farming. It’s quite interesting. A little meticulous (the farming isn’t meticulous, but the part wherein I have to chase a girl to wed -_-;;) nonetheless, the farming part is quite interesting. And to take care of your own vegetables, grow it, and then eat it is just amazing! Especially if you put a lot of love into it. 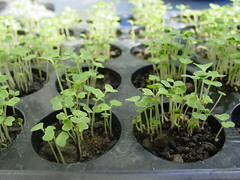 At home, our bokchoy seedlings are starting to grow and it’s quite exciting. I hope we could maintain it. My cousin really did a great job starting it, pray my luck it would grow and we could maintain it! I’ll be posting here my own ‘tales of agriculture’ as we try to grow our vegetable garden. *sigh* In between work, anime watching, manga reading, doll collecting, and model crafting, I hope I can devote my time for my gardening. On the side, look, I have a Jikan Ga Nai (trans. I have no time!) icon at the side. Yup. Time remains rather elusive.